A ship? 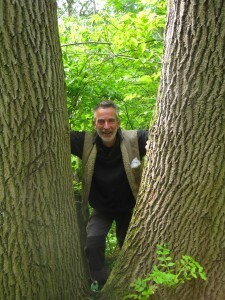 In the wood? I must share this brief but delightful story of ‘The Ship’ in Hollington. 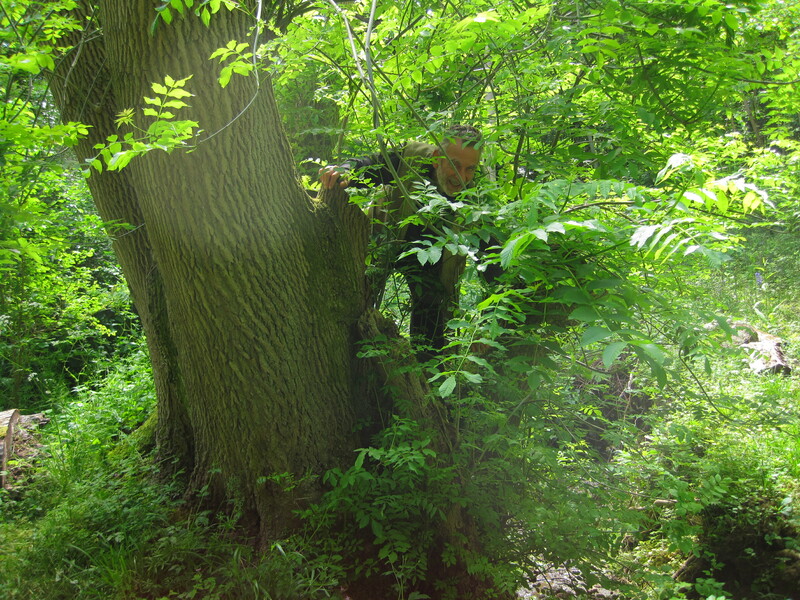 Beside the stream running through the wood, stands a large, very old, recently coppiced ash tree. When Philip and his siblings were much younger they turned this old tree into an imaginary ship, playing on it for hours, even using rigging thrown around the branches to add to the reality. With a child’s imagination, a particular branch overhanging the stream resembled the prow of an old ship reaching out to sea. Since then this lovely old ash has been affectionately known as ‘The Ship’. More recently The Ship became unsafe and was in dire need of coppicing which led to a bit of an adventure. Whilst up a ladder and in the midst of a crucial point cutting through the trunk, John noticed a cloud of bees just a few feet above him. Unbeknownst to John or Philip, in the trunk just above, was a wild honey bee’s nest. Bees are renowned for their dislike of vibrations and clearly weren’t impressed by the chainsaw activity. I have very limited knowledge of honey bees but I understand the wild variety are virtually extinct in many parts of the UK, therefore I wonder if these are actually feral honey bees? 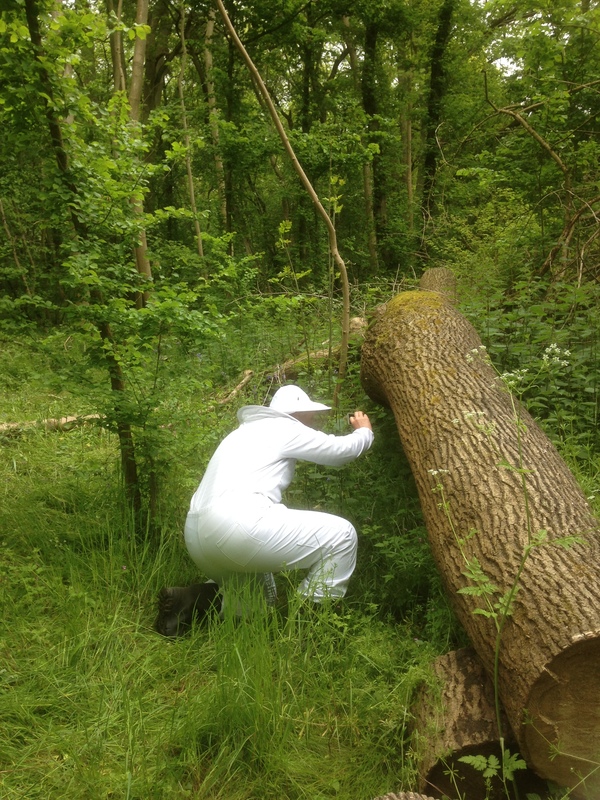 Anyway, John continued sawing and thankfully no harm came to either the bees or to John and the nest remains active in the felled trunk. I took a careful look at the nest out of curiosity but kept a respectful distance. You can see in the photograph one of the beekeepers also taking a curious look. Without the appropriate protective gear I didn’t even attempt to get this close . 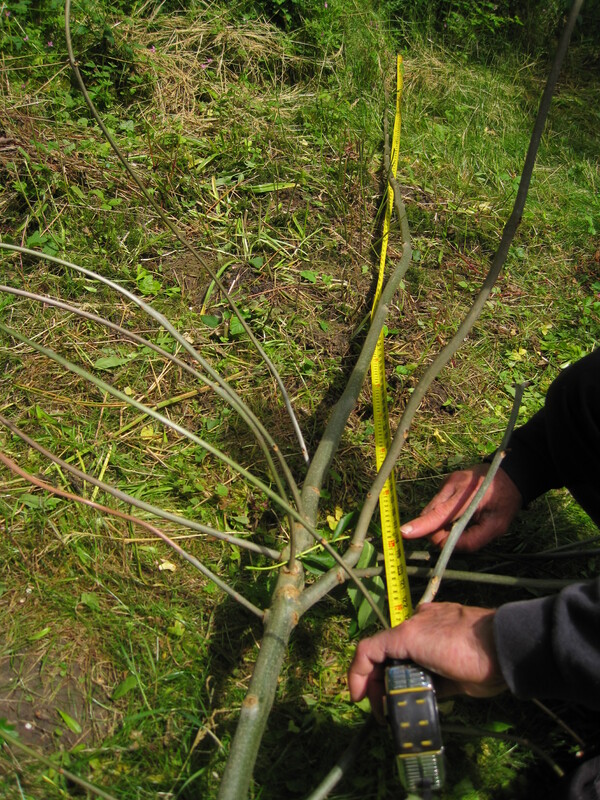 As with all the coppiced trees in Hollington, Philip and John keep an eye on the stumps and their new shoots. 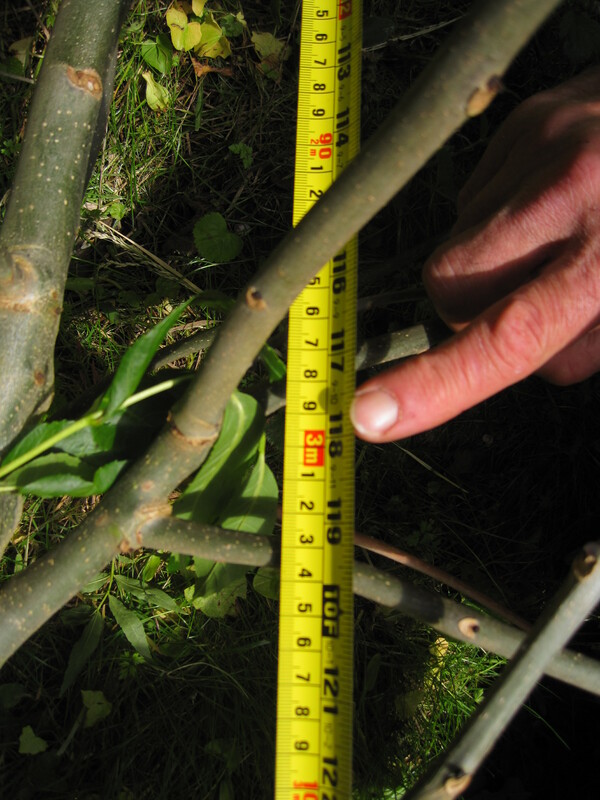 Ash shoots are known to grow up to 2.5m (approx 8 ft) in the first year of coppice and even more in the 2nd year. The growth then slows in year 3. 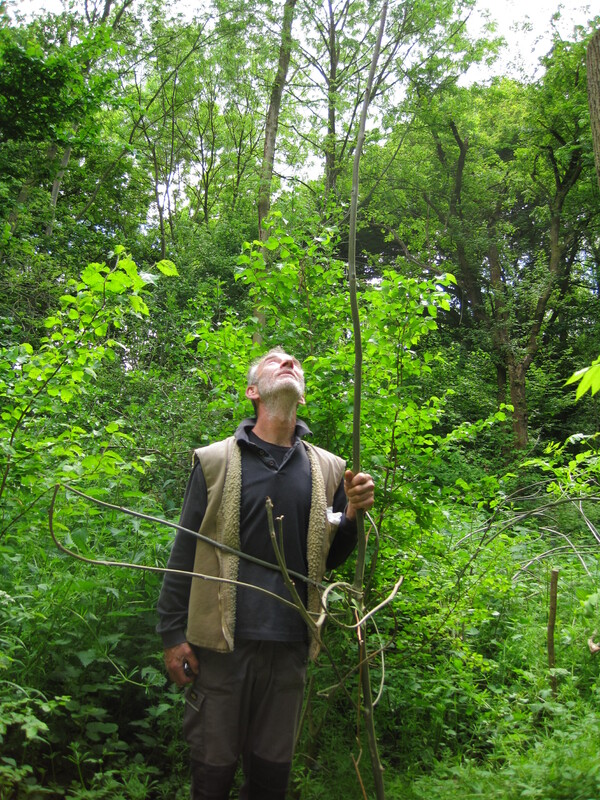 The new shoots from the coppiced Ship were impressive. In the first year, one stem alone grew 1m (approx 3ft) and in the second year the same stem grew a further 3m (approx 10ft). A grand total of 4m (approx 13ft) in 2 years. Thankfully The Ship avoided any browsing deer, rabbits, hares or voles which can severely affect the growth or even survival of recently coppiced trees. Deer in particular can be quite a menace. The Ship is showing every sign of a successful coppice, with plenty of tall, healthy, strong new shoots. Even more years are ahead of it, continuing to stand guard over the stream.